You can access all UVK features using the keyboard. This can be useful if you're trying to repair a machine which mouse doesn't work. See below how it works. 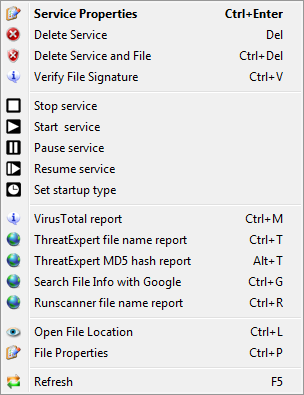 Both UVKSetup.exe and UVKPortable.exe packages use common Windows controls, which you can select select using either the Tab key or the Left / Right arrows. Button: Pressing the Enter key when the button is selected will perform the same action as if you click it. Checkbox: Press the + key to check, the - key to un-check. Use the INS (Insert) key to select and navigate trough the UVK custom buttons and checkboxes and select the custom control you wish to click, then hit Enter to execute. The control you select using the keyboard will be hilighted. When moving the mouse over a keyboard selected control, the keyboard selection is automatically reset. To select a line in a list, such as the Process list, in the Process manager section, use the Up/Downl keys in your keyboard. After selecting the desired line, you have several key combinations that allow you to perform all the actions available in the right-click menu. 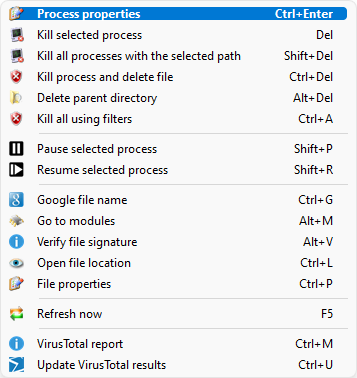 If the mouse isn't working, you can make the context menu visible by pressing the Menu key in your keyboard, if available. 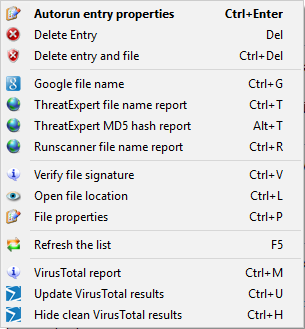 A good idea is to print this page, so you can have the hotkey combinations available when you need. In the sections that have input controls or text boxes, use the Tab key to toggle between these controls. So, basically, you just have to use the Tab key to switch between common windows controls, and the Ins key to switch between custom controls. The Esc key always goes back to the previous screen (usually the welcome screen).